After a day on the beach (and quite a few before that), I decided that we had to do something. And a boat trip sounded like fun. So we booked a rather cheap one on a traditional longtail boat.We were picked up at our bungalow at 8.30 am and realized we were to spend the day with a bunch of middle aged French people. Not exactly what we had imagined, having chosen the cheapest option that was surely attracting some backpackers. But well. We set off with our boat at the old town’s harbour, dropped of two other tourists at some other island’s resort before we went to the first snorkeling spot. If was nice there but quite crowed with quite a few other boats dropping of their passengers there and as Michael pointed out “nice fish but dead corals”. Later we had lunch in another beautiful island. Nothing more to say than that it was very beautiful there. After that we went to another snorkeling spot that was less crowded and with that much nicer and than back home. It was quite a beautiful trip. Very much value for money. And I really enjoyed “doing” something. 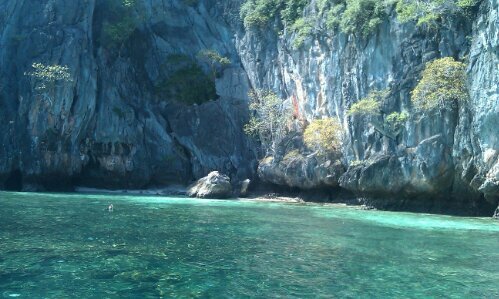 This entry was posted in Thailand and tagged Beach, Sea, Snorkling, Summer by kathatravelling. Bookmark the permalink.